These days, superhero movies need a little something extra to make them stand out from the pack. They can’t just be a typical, big-budget, flashy action movie. There needs to be a certain level of humour, pathos, or some poignant commentary that takes the film to the next level. In the case of David F. Sandberg’s new DC movie Shazam, that’s exactly what happens, by hiding a movie about the power and importance of foster families inside a sometimes-silly superhero origin story. Shazam is the story of a young orphan named Billy Batson who is given the power to turn into an adult-sized superhero whenever he wants just by saying the word “Shazam.” He’s played by Asher Angel in his teenage form and Zachary Levi in the hero’s adult guise. Billy is selected by an ancient wizard (also named Shazam and played by Djimon Hounsou) to be a mysterious champion for the world and take on the wizard’s God-like powers. So, when Billy says the word “Shazam,” Angel becomes Levi, complete with the whole superhero body, costume, and an array of powers. Billy may be the superhero, but he’s not exactly sure what that entails. Thankfully, he recently moved in with a new foster family and one of his new foster brothers, Freddy (It’s Jack Dylan Grazer), knows all about it. Freddy is a huge superhero fan who wears Aquaman t-shirts, hangs Batman posters on his wall, and owns a bullet that supposedly bounced off Superman himself. Using that knowledge, the two of them attempt a litany of experiments to figure out Billy’s powers. These tests are mostly funny and exciting and quickly help build a strong friendship between Billy and Freddy, which also ends up being the first seed of Shazam’s larger family story. The boys even develop a brotherly rivalry after their antics end up on YouTube and they become social media superstars. 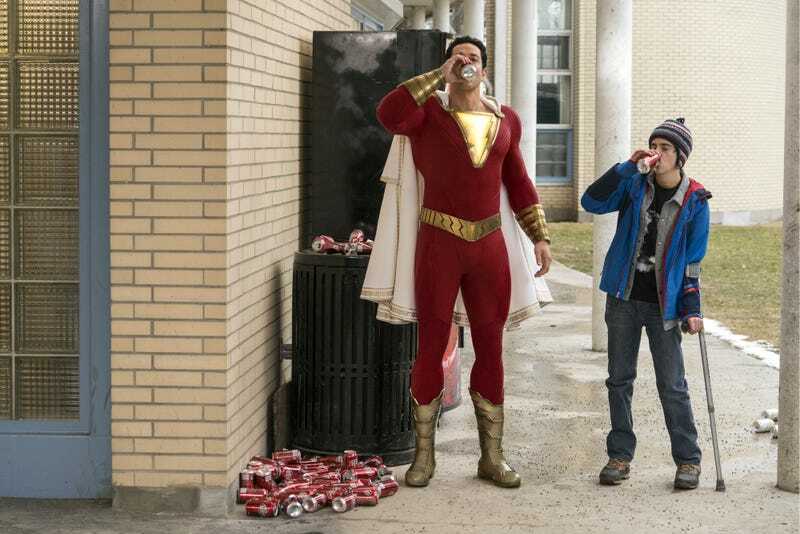 Shazam and Freddy pound some sodas. Photo: Warner Bros.
Angel and Levi are excellent as Billy. Their performances line up almost perfectly so that you’re always very aware it’s a teenage boy at the heart of the character. Grazer is charming and sympathetic as Freddy too, and his excellent chemistry with both Angel and Levi strengthens the entire movie. 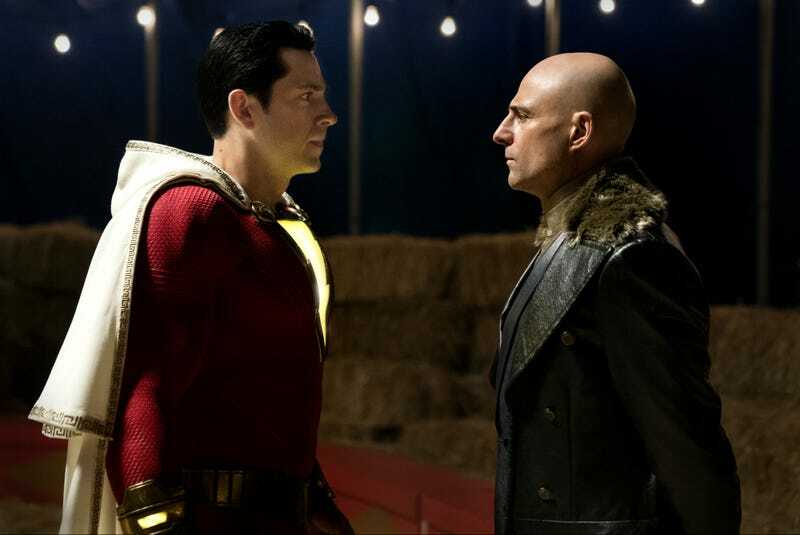 Shazam also devotes a lot of time to its villain, Dr. Thaddeus Sivana (Mark Strong). As a boy, he was almost selected to receive Shazam’s powers, but failed the final test, unlike Billy. Ever since, he’s devoted his life to finding the wizard and getting another chance, by any means necessary. When he learns that Billy was chosen, Sivana believes he has finally found the answer to his life’s work. The prominence of Sivana’s story in Shazam is rather unexpected considering the title of the film. The story starts with him, develops him, and for the first third of the movie, he’s basically the focus of the film. And yet, Sivana’s never quite that complex a character. Strong has the time of his life playing this over-the-top evil guy trying to kill a little kid but, beyond his intense villainy, the role is rather one-note. That, coupled with the overemphasis on Sivana’s backstory, makes some of the time spent with the villain feel wasteful. 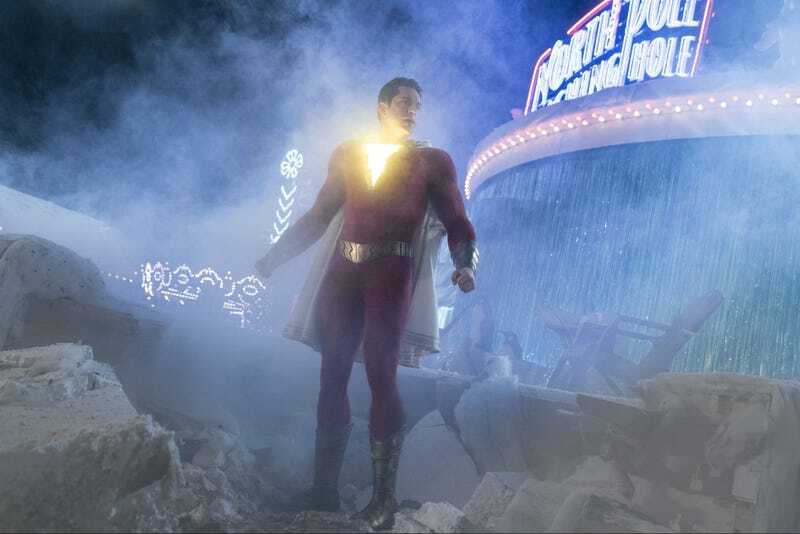 While it feels like Shazam should be the main attraction, even when he’s on screen early on, his learning curve feels much slower than the typical origin story. Shazam has all these powers, but for over half the film we just see him showing them off over and over without a distinct, heroic progression. That repetition, along with the focus on a scary but static villain, hinders the movie around its midpoint. The imbalance in character development begins to breed uncertainty about what exactly this movie is trying to be and as a result, it can feel stunted at times. Shazam and Sivana show down. Photo: Warner Bros. Eventually though, as the stakes get higher and Billy gets stronger, many of the seeds planted throughout the beginning of the film start to bloom. The action, especially in the third act, is impressive, with CG effects that make two men flying and fighting in mid-air actually look good. Also, the way the film feels slightly restrained early on ends up giving the third act a real catharsis. There’s a sense that while some of the pieces of the tale might have felt awkward before, they’re finally fitting together. The stakes may not be as high as in other DC movies, but they feel complete and satisfying nonetheless. That’s also, in large part, because of the family dynamics at play. While the superhero action and comedy may be Shazam’s big selling points, what makes it truly great is the touching story of a foster family weaved around everything else. Even as we see superheroes, villains, and sidekicks arise, Shazam is very careful to spend a decent amount of time focusing on Billy’s life as a foster child. He’s confused and scared about opening himself up to these relative strangers—so, just as he’s trying to find himself as a superhero, he’s trying to find his way into a large, diverse family too. Billy’s backstory before joining them is made up of some truly heartbreaking moments, and his foster parents (played by Marta Milans and Cooper Andrews) and siblings (Faithe Herman, Grace Fulton, Ian Chen, and Jovan Armand) try to help him. These family members give earnest, heartfelt performances, especially Herman and Fulton, who are basically the only women in the movie. Each has a strong, albeit slight, storyline that gives them a pop of prominence. The delicate blend of both those stories is what makes Shazam shine. Sure, it’s fun to watch Billy fly and shoot lightning out of his hands, but it’s even better to see him trying to find ordinary happiness. There’s a real humanity to the foster family aspect of the story and it ends up paying off with some big surprises and possibly even a few tears. There are a few hiccups along the way but Shazam is undoubtedly another win for DC. It never quite reaches the bombastic heights of Aquaman or sheer gravitas of Wonder Woman but it’s got heart enough for all three, a good balance of humour and action, and near infinite potential for the future. I have no idea how this innocent, lovable boy ends up fitting into a larger DC universe but it’s going to be really exciting to find out. He’s a star.